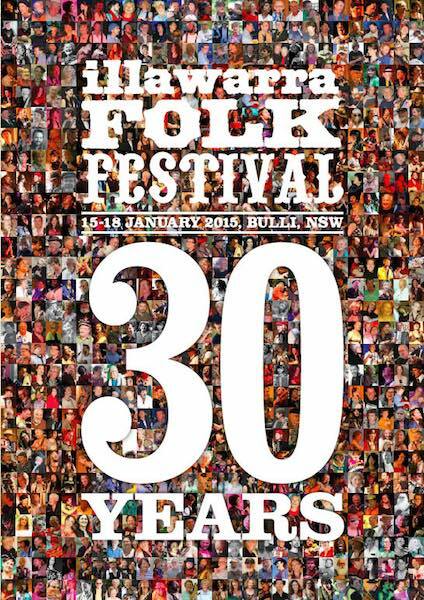 The Illawarra Folk Festival will be celebrating its 30th Pearl Anniversary in 2015, and the engine room is full steam ahead with plans for what will be their greatest celebration and collection of Australian and overseas folk talent. With 180 acts made up of 15 international acts, 74 national and 91 local Illawarra acts in 450 concerts, dances, workshops and sessions in 13 venues this festival will be a pearler. National artists: Stephan Pigram, Eric Bogle, Ted Egan, Folkaphonic Youth Orchestra (premiere), Allez-gator, Appalachian Heaven String Band, Azadoota, Bernard Carney, Big Erle, The Bottlers, The BordererS, Chloe & Jason Roweth, Claude Hay, Cloudstreet, Curragh, Dave de Hugard, David Beniuk, Deep River, Choir, Enda Kenny & Lindsay Martin, Fred Smith, Guerilla Zingari, Gina Williams & Guy Ghouse, The Go Set, Greg Champion, John Broomhall, Jordan C. Thomas, Junior, Lagoon Hill Zydeco, The Lazy Farmer’s Sons, Lime & Steel, The Lurkers, The Mae Trio, Margaret & Bob Fagan, Martin Pearson, Melbourne Scottish Fiddle Club, Michael Fix, Mike Martin, The Morrisons, Neil Adam & Judy Turner, Nick Rheinberger, On The Stoop, Pat Drummond, Sally Harris, Sparrow-Folk, Springtide, The Squeezebox Trio, Stray Hens, Takadimi, Terry Serio’s Half Truths, Timothy James Bowen, The Transylvaniacs and Kengugro, Vardos, The Wish List and many more.